I guess it’s good to be busy. Keeps me out of the bars at night, hee hee! Wednesday evening I came over to the valley to take Kid the Younger and his fiancee to the airport early Thursday morning. They are off to Cleveland for a couple of weeks. I also kitty-napped his cat to come spend the summer with me. While they are gone I am taking advantage of their house to be able to sleep in an actual bed instead of the van, which is what I normally do during Black Sheep. Ah, Black Sheep. I love this show. I missed it last year because of my shoulder surgery. I didn’t bring sheep, but I did help with showing. 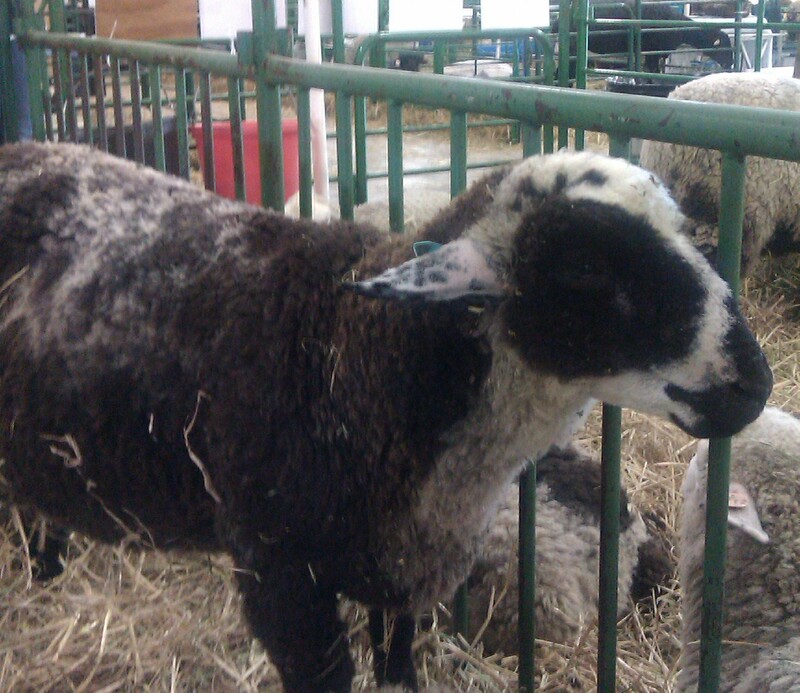 I handled this (2nd place Romeldale ram lamb) and this (1st place Romeldale ewe lamb, and also Reserve Champion). They and 1 other lamb also won the Romeldale Young Flock, which meant they got to come back in the ring at the end of the day for the big trophy. They didn’t win, but they were pulled into the middle of the ring for serious consideration which was a big deal. The ewe lamb went home with my friend Correy, the ram lamb went home with my friend Jan, so my budget was saved from depletion. He was so funny because at one point I moved my hand from under his chin and his head fell, because he had fallen asleep in my hand! They are both from Reflection Farm in Eaton, Washington. Judging the Spinner’s Lead was a hoot. The entries get better and better. My breed Association has been asked (and agreed) to take over management of the Lead, and now that I’ve experienced it from both sides I have some ideas on some changes that I think will make it run a little smoother. I will talk them over with the lady who was the other judge to make sure that I’m not missing something. As a “thank you” for helping out, I was given a copy of “New England Knits”, and there are a couple of things in it that are in my knitting queue already. The other fun part of the weekend was hooking a new spinner. She was watching me spin on my wheel, and we got to talking. I showed her my Golding spindle and how it worked. Pretty soon she wanders off to look at the vendor booths, then comes back to ask if I’ll look at some drop spindles with her. She now owns a Jenkins Swan turkish spindle and lots of roving, and when I showed her what to do turns out she’s a natural spinner! 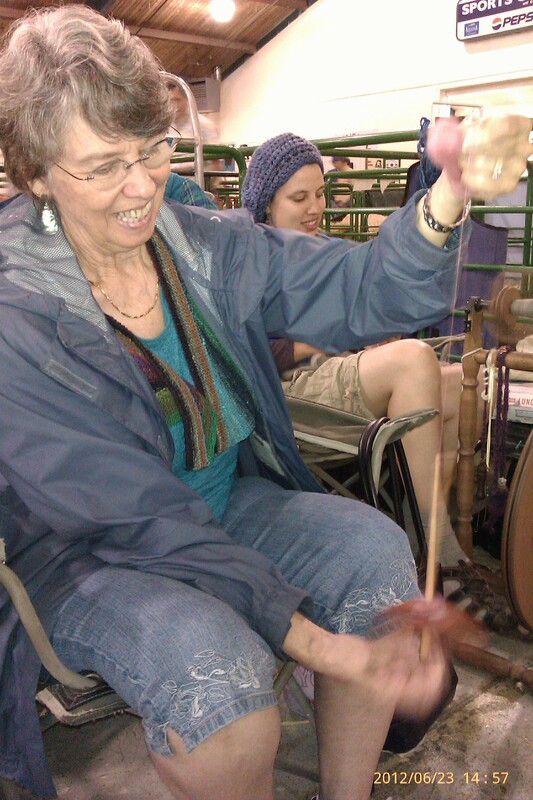 She was spinning lace weight from the get-go! This picture is when she had been spinning for all of 10 minutes! I told her it was all about getting the right teacher. She had to teach a knitting class Sunday afternoon, but we got together afterwards to answer a couple of questions, and she gifted me 2 of her patterns as a thank you. And what was I spinning all weekend you might ask? 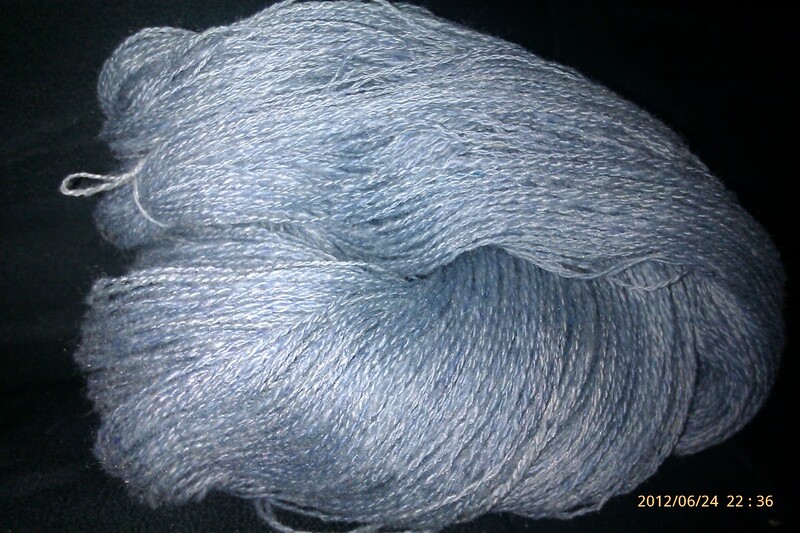 That’s one of my Blue Skies batts (2/3 Romeldale, 1/3 rayon). Two ounces worked into 416 yards of laceweight yarn. 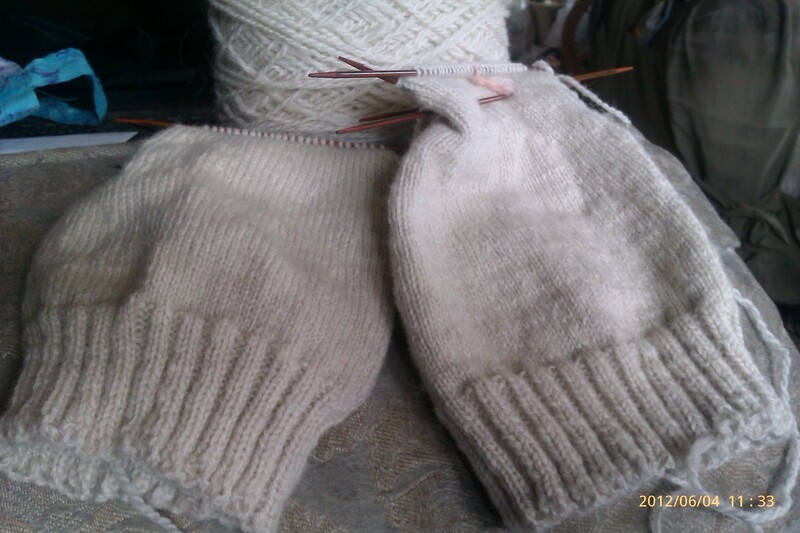 I started the 2nd batt last night, hoping to finish all 3 before the Tour de Fleece starts. 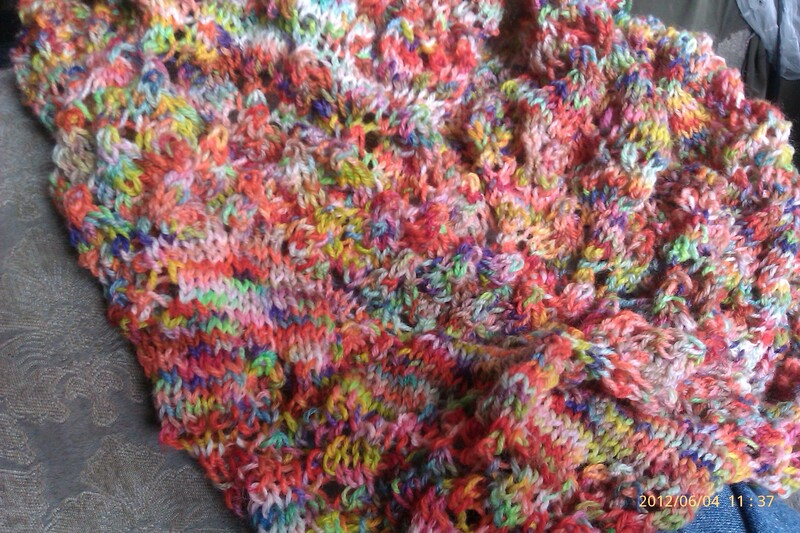 I’m thinking of working it into a lace shawl during the Ravelympics. I’m staying in the valley until tomorrow, since I’ll be picking up turkeys and chicks from the hatchery in the morning. I’m getting 10 poults (I’ve already pre-sold 4 of them) and 50 chicks. I went with what the hatchery calls their “Fryer Pan Special”, all cockerels, instead of the Cornish Cross, which I find grow faster than I can deal with them. I can handle processing a few birds at a time, which should work out just fine. Need to start seriously looking for a freezer so that I have someplace to put them all! Mom lets me keep stuff in hers, but that means I have to plan ahead when I want something. One more day to relax, then back to the grind! It’s been a busy couple of weeks. Not a lot of pictures to share, because they are all on the digital camera and I can’t find the cord to transfer them to the computer. Started with the trip to Montana. Kid the Younger was supposed to come over after work but got sick the day before we were set to go. Too late to cancel the hotel reservation, so I decided to go ahead by myself. Wouldn’t have even hesitated in the past, but I’ve become a bit housebound lately. I left about midnite (napped early in the day in anticipation of the Kid coming over). With a couple of stops for gas and to shut my eyes for a little while (I have no problem pulling over if I’m tired), 18 hours later I was settled in the hotel room. Met with a very nice “Welcome” basket of assorted goodies which included the itinerary for the weekend. Just in time to meet up with everyone for appetizers and a drink. Then I went and soaked in the hot springs that the hotel is known for. For the first time since my shoulder surgery last summer, I even attempted a little swimming. No, I didn’t attempt, I did it! The muscles were weak, but I managed 2 laps of the pool, and it felt SO GOOD! The wedding was moved into a tent the next afternoon due to uncooperative rain, but it was a beautiful ceremony. All 4 parents spoke during the ceremony, and the officiate was a friend of the couple, so it was all very lovely. Unfortunately, someone had placed the lace shawl I gave the bride in the reception hall, so she didn’t have it to wear during the ceremony, but the official photographer got some pictures of her and me with it, so I’m hoping to get one of those soon. It matched the color of her dress perfectly, and I got tons of nice compliments from several people. I danced way too much as far as my back was concerned, but the kids kept insisting. I do have to say that this group of young people are the most beautiful people I know, both physically and mentally. Daughter is still very much a part of their lives, and I feel very blessed that they continue to include me in her stead. I was introduced at one point as the “Spare Mom”, and they have all said that when babies start coming I get to be “Spare Grandma” too. I get to be the fun one that lets the kids play in the dirt. The next day I left for home via Yellowstone. The weather was still cold and rainy, but it was great. I’d never been before, and I’m already planning a trip back! The nice thing about being alone was that I could take my time and go where I wanted (not that Kid the Younger would have objected to anything I wanted). I saw lots of buffalo moms and babies (yeah, yeah, I know they’re really bison). At the very end of the drive I also saw some elks with their calves, including one with triplets! Not newborns either, they were at least a month old and looking good. I was very impressed with her mothering abilities. I also took the side trip to go see Old Faithful, arriving just in time to see it go. Timing is everything! The final push for home took longer than I had anticipated, mostly because I took so much time enjoying the park. I had told Kid the Elder that he’d have to feed if I wasn’t home by 5, so it was no big deal other than having to pay for a night in a motel again. Better than sleeping in the car! This weekend I got to pick up my raffle goat. 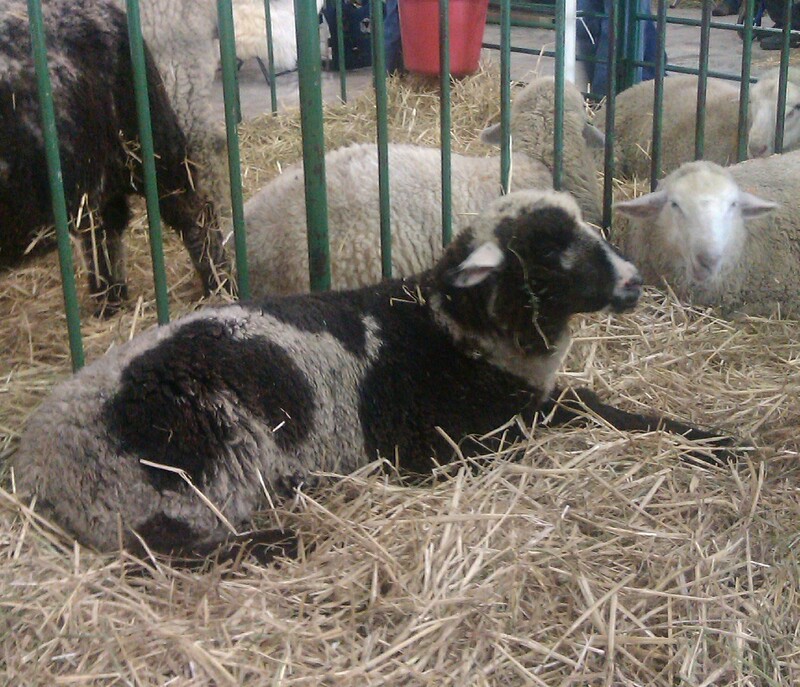 The breeder made me a deal on a 2nd doeling too, so now I have 2! Meet Clara (on the left) and Clover. 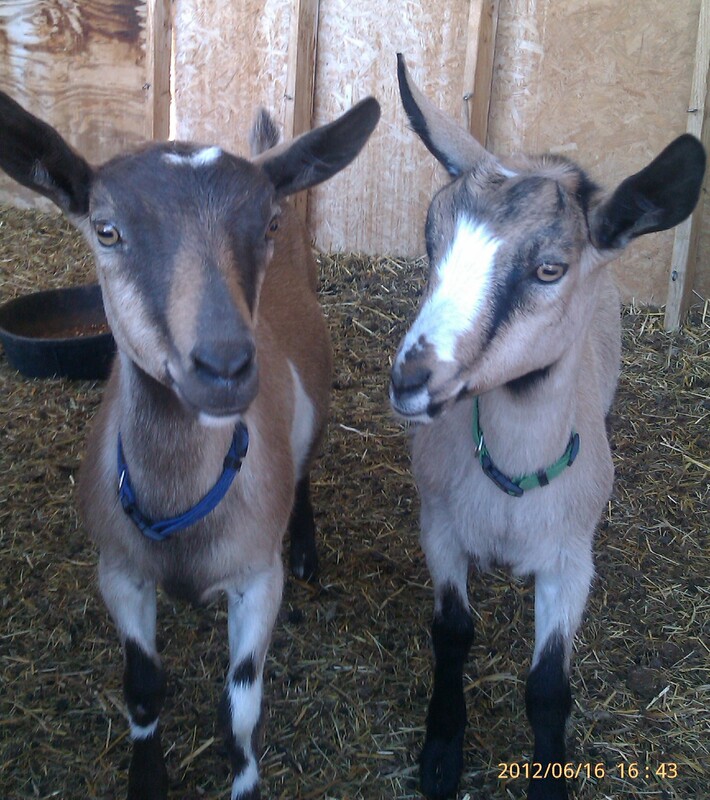 Both are registered Alpines, and I can hardly wait until I start milking! The original plan was to keep them segregated from the lambs for a few days while they got used to me and their new surroundings, but they vetoed that idea by jumping over the panels locking them in the barn. Clara even got in with the rams for a while, but we’ve fixed that hole. Clover is a little more stand-offish, but they are warming up to me. Clara is actually a snuggle bug. I’ve already started rubbing her all over to get her used to the idea that I’m going to be touching her everywhere. I’m taking things a little slower with Clover until she quits thinking I might eat her at any moment. She watches carefully while I handle Clara, just out of reach most of the time. I’m allowed a couple of scratches, and I’ll take that for now. The lambs have accepted them completely, which is nice. This afternoon they all got to go out on the pasture and were very good about coming back into their pen at feeding time. The ewes were sure that my not letting them out was the result of some horrid clerical error, and complained loudly, at least until I gave them the results of spending an hour with the scythe yesterday morning. There is something so satisfying about feeding home-cut hay. I don’t have enough to do it full-time, but a couple of hours work will help cut the hay bill this summer, and it’s easier than putting up fences. I am not an expert with my scythe, but it gets the job done. My back is good for about an hour of cutting. Not as fast as the mower, but I won’t feed mower clippings to the beasties. A little exercise for me, a little fresh hay for them. Sounds like a winner to me! I believe that we all have the ability to be creative in one way or another. However, as children there are constraints put on our creativity. “Color inside the lines”, we’re told. Especially as women, we are taught to take care of everyone else, and maybe if there’s any time or energy left we are allowed a few moments to take care of ourselves. Listening to the Muse is important. It feeds our soul, recharges our batteries, nurtures us. Too many adults wait to have time or ignore this important aspect all together. It doesn’t matter what your creative outlet is. Singing, dancing, painting, writing, whatever. Figure out what is right for you and do it. Don’t wait for time, make time. If the kids are little, enlist them. Teach them to enjoy the things that make them happy. Buy good supplies; you are worth it! I’m not sure where or when I learned this lesson. It certainly wasn’t at home growing up. But by the time I had kids I knew that I had to create. How the Muse spoke to me has changed a bit over the years. I’ve sewn, quilted, painted, written a bit. Now I mostly spin, dye and knit. Ideas flit through my mind, and I try to jot them down if I can’t jump right in. More ideas than I can possibly accomplish in my lifetime, but that’s ok too. Last Wednesday night the Muse spoke pretty forcefully. I tried to tell it there wouldn’t be time to finish a shawl before we left for Montana. 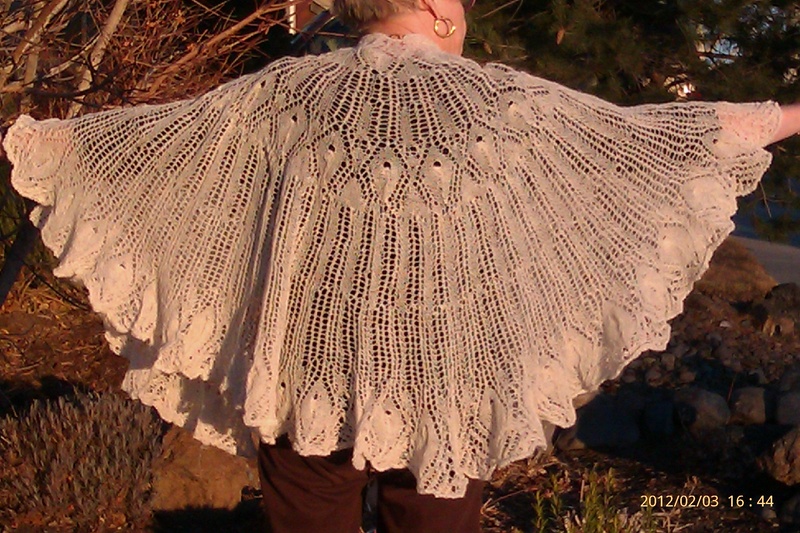 After all, the re-do of the wedding shawl took 2 weeks to knit, and I had a pattern for it. The Muse insisted, so I pulled out a needle and cast on. This afternoon I finished the last point of the edging, and this is now blocking on my bed: It’s not huge – about 66 inches across the top and 34 inches deep. Even looking at the picture makes me smile, and I’m glad the Muse was so insistent. I will happily wear it at the wedding. I’ve got 24 grams of yarn left, which I’m hoping will be enough to make a pair of short fingerless mitts for someone. 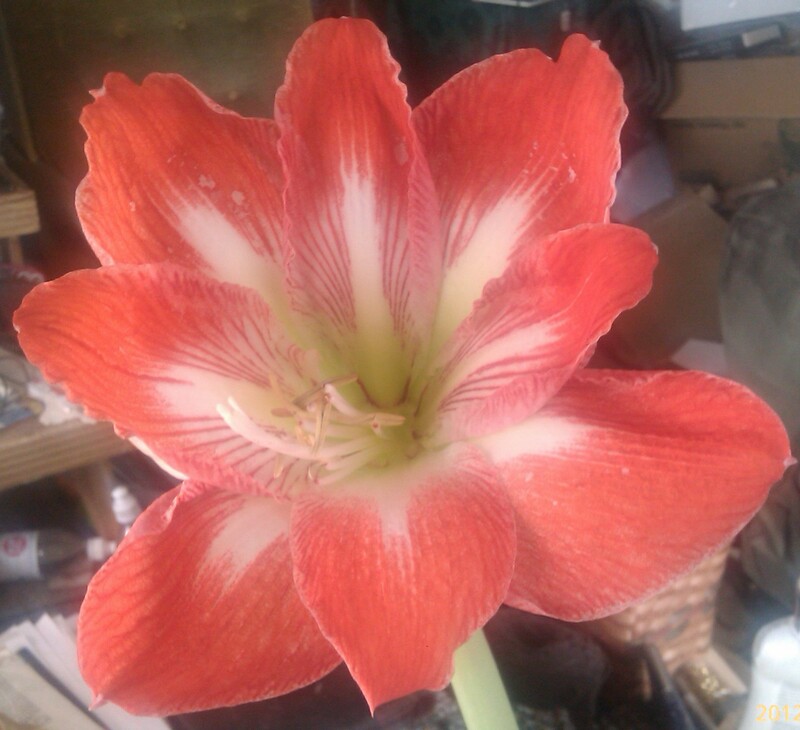 I forgot to share this picture of the third bargain amaryllis blooming last time I posted. Enjoy, and listen to your Muse!